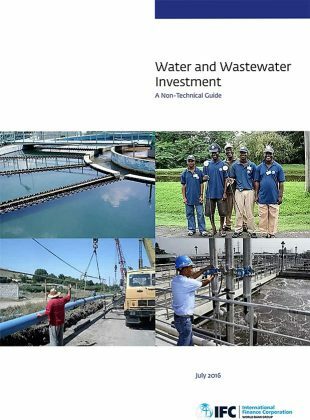 The idea for an International Finance Corporation (IFC) Guide to the Water and Wastewater Sector came from the huge need for funding in the water sector but the limited number of IFC investments. This is puzzling as water investments are very effective in delivering both good development outcomes and good returns. Also in developed markets, water is regarded as one of the safest homes for capital providing good, steady returns from regulated utilities. Water investments can also be challenging, both technically and politically. They have the perhaps undeserved reputation for not being easy to deliver and suffering from political risk. Yet most of IFC water investments are in corporate vehicles which deliver efficient services and can extend these services to the poor. They have a low level of non-performance and good returns. This shows that with the right partners and structuring, water investments can work well. Due to growing cities and the impact of climate change, there will be a 30% water deficit by 2030, mainly in emerging markets. IFC Investment Officers (IOs) may be approached about a wide range of possible water investments and cannot be knowledgeable in all areas. What is the water and waste water sector ? What are its technical and financial components and how does it function ? What are the linkages between the operational functional activities and the financial statements ? What internal (business) and external (environmental, regulatory, economic etc) factors can affect and alter these outcomes ? What to look for when undertaking an assessment for a specific water and waste water sector investment opportunity ? What are the main non-financial risks and how can they be identified, understood, mitigated and/or managed ? The emphasis in the Guide is on a practical and accessible project screening tool for water and waste water projects. It introduces the concepts and language of the sector, so IOs can identify the main risks and ask the relevant questions at an early stage. It is also supports IOs looking for possible water investments in their areas. It is not designed to be an in-depth technical handbook nor replace specialist technical input. Battus were commissioned by the IFC Water & Municipal Infrastructure Technical Specialist team to produce the Guide. A 50 page document, with main text, 8 technical annexes and associated graphics, was delivered, as an IFC format publication, in 3 months. Also required were (a) a 2 page aide memoire for IO field use summarising the main points within the Guide and (b) a short presentation for IFC Technical Specialists to use in rolling out the Guide across the 80+ offices world-wide and 200+ IOs.